Happy 4th of July! Hope everyone had a monstrous weekend! (Get it? Eh? Eh?) 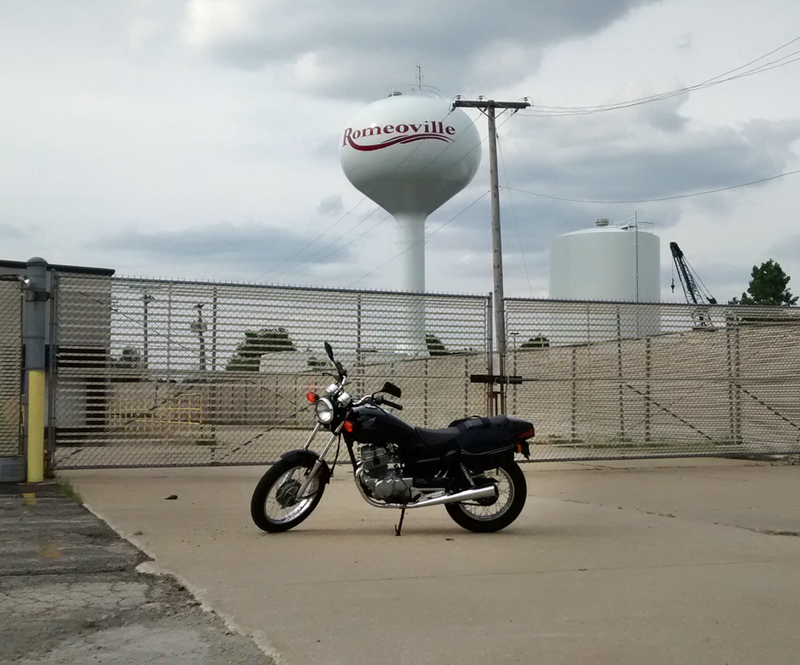 I rode out to Romeoville on Saturday before the rain hit. There’s a large industrial area there and I had a great time exploring and subsequently getting quite lost. I took Rt. 53 south the whole way down because I was kind of tired and wanted a more relaxing ride. However, it was anything but. I don’t know if it was the holiday or what, but traffic was horrendous. I can’t even count how many cars and trucks tailgated me, cut me off, turned in front of me, or nearly pulled out in front of me. Things like that happen every time I ride, but this ride was just riddled with encounters like that. 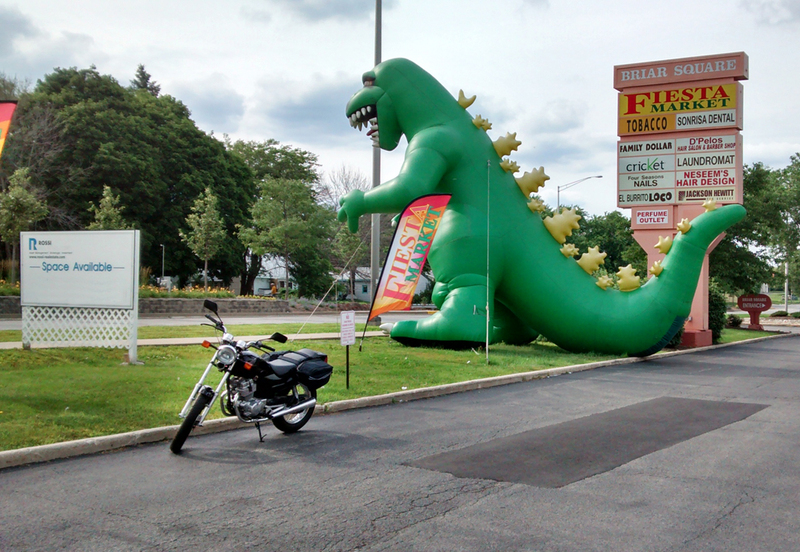 As I was pulling out of the busy parking lot here, I saw a van approaching quickly on my right. He wasn’t looking my way at all. He was just looking at the exit. We were going to approach at the same time, so I sped up a little and kept watching if he was looking. He still wasn’t looking, so I honked my horn at him as I went by him. I got by safely, but I still don’t know if he ever saw me or heard me (his window was down but that doesn’t mean anything). Afterward, I realized that I should have handled that differently, and felt very fortunate that I exited that encounter unscathed. I should have simply slowed down or stopped and waited for the van to pull into my path since I knew he wasn’t paying attention. That’s what I usually do in situations like that. Better to just let the vehicle get in front of you so you can put the danger in front of and away from you. But I suppose I my blood pressure was already up from the earlier part of the ride (this was my first stop) where I was basically re-enacting that scene from The Lion King where all the wildebeests are stampeding through the gorge. It was a moment when I let my emotions get the better of me. When I saw the van approaching, it just ruffled my feathers. My attitude was basically: “I have the right of way, and I’m going to prove that I do.” And that’s a really dumb attitude to have on a motorcycle. As I said, fortunately, nothing bad happened that time, but I did spent the rest of my ride thinking about how I should have handled that differently. After a few more miles dodging wildebeests, I turned off into an industrial park and found myself in Romeoville. Never been there before, but pretty much any type of business you can think of has a warehouse in that park. It was very large, and there were some semis coming through, so I had to be careful to make sure I stayed well out of their way. Since it was mostly warehouses and manufacturing, the landscaping wasn’t quite as lush as it is at office parks. I also had to be careful in riding because there was a lot of loose gravel on the pavement from trucks pulling in and out of various businesses. I was also on the lookout for anything metallic-looking like screws, nails, or hooks. Rounding a curve, I spotted a piece of diamond-plate that must have broken off of some truck’s running board, and successfully swerved to avoid it. I always appreciate how nimble the Nighthawk is in moments like that. I got a little bit lost trying to get out of this industrial park, so my ride ended up being longer than I intended. I was out for around 2.5 hours, a good 30 minutes of which was trying to find and get to a road that would take me home. Not an easy task for someone who is as directionally-challenged as I am—even with Google Maps. When I finally pulled into my driveway, hungry, tired, and exhausted, I decided I need to get myself a compass.